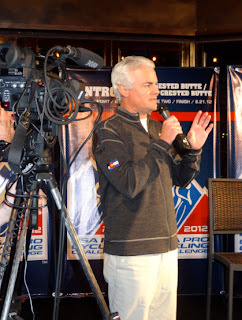 Two nights ago I was fortunate to attend the announcement event for the USA Pro Cycling Challenge UCI Pro Tour 2.HC race in Colorado planned for August 20-26, 2012. It was an interesting evening. In a relaxed atmosphere, I didn't feel like asking questions, or even taking many pictures. How could I with so much mind-candy inches away from me; a huge cycling fan. 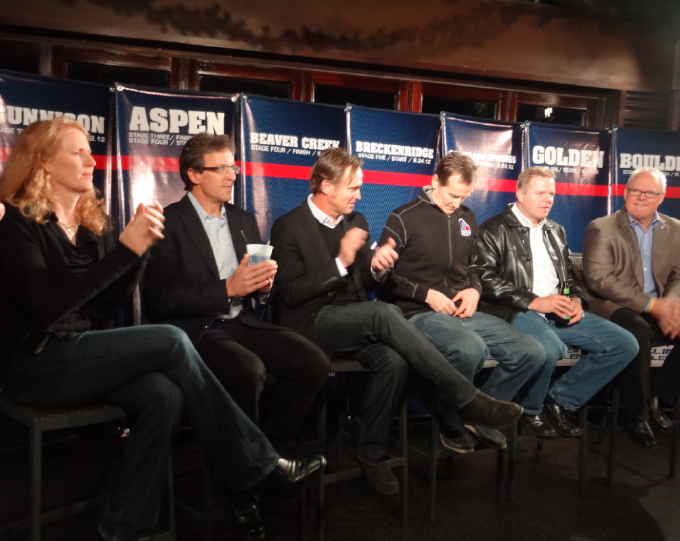 The room was filled with individuals who have an interest in, or who have contributed to, the USA Pro Cycling Challenge, each of us with our unique niche. 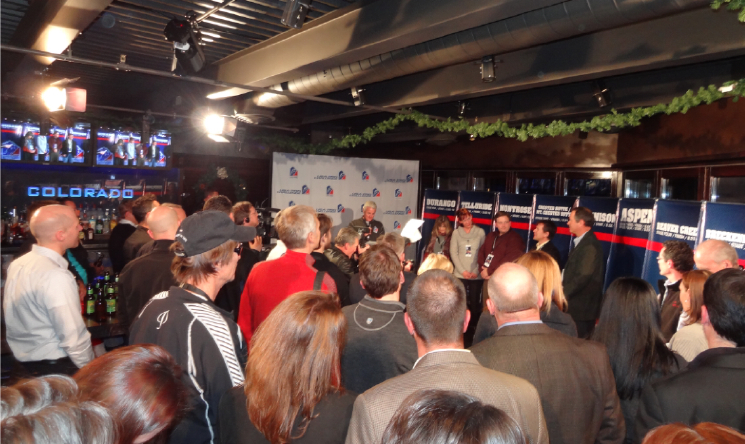 Immediately upon arrival I felt the warm welcome from the USA Pro Cycling Challenge staff. I walked to the bar to grab a cool drink and started a conversation with Dan Grunig from Bicycle Colorado, who introduced me to Jacob Smith the Mayor of Golden. I turned around and had a great conversation with Shawn Hines manger of sponsorship at New Belgium Brewery. I turned left and began a conversation with David Stone of Post Modern who made the promotional videos for the evening's host city announcements. A few nights ago my Mother asked me the question, "how do these routes keep getting leaked?" (the routes of the USPCC, the Tour de France, and the Giro d'Italia were all leaked for 2012). I explained that there are so many people in every city involved in permits, roads, budgeting, local government, police, businesses, bid processes, etc., that the routes can be figured out pretty easily. I explained, "If one small town newspaper reports a story, you can go to a map and guess which town is a hundred miles away and be pretty close by connecting the dots." The point is that it takes a village to put on a bike race, in this case it took 12 villages, plus all the people at the party the other night, lots of sponsors, thousands of volunteers, and many many more. A common theme in conversations was how big the race was last year for it's first year, and how it really caught on with the fans turning out in huge numbers. After being at the Tour of California since it's inception, I was expecting the USA Pro Cycling Challenge to take baby steps and grow slowly, instead it took one giant boot step forward and smashed it's way into a UCI upgrade after year 1 with over 1 million spectators and 25 million people watching on TV from 161 countries around the world. Forget the quaintness of years gone by. The online world of instant news and easy access to cycling year round has changed this sport forever. Fans no longer have to wait until July every year for their 3 weeks of bike racing, we can watch races live in Europe on any device, we can watch YouTube anytime we want, we can read blogs or tweets to see what riders are doing in real time. We are exposed to so much, that fans now come to races with instant knowledge, recognizing both American and European riders with ease. Knowledge and accessibility builds fans. Plus it's free to spectators - what could be better for fans. Mayor John Hickenlooper also announced a Colorado Cycling Holiday to correspond with annual race dates, recognizing the week (August 20-26, 2012) as an "honorary holiday." Sorry, you still have to go to school.